KomissarBojanchev wrote: What is the logic in making Mi-35s fixed gear. I have to admit, retractable gear Mi-24s look far more aesthetic. All the above plus it's a good contingency in case SHTF and one need's to land asap, possibly having taken severe damage in electrics/hydraulics. Better than belly landing this monster of a chopper. Lighter, cheaper, simpler, less maintenance, and the fact that it is always deployed which means it offers better energy absorption in case of a crash. The negatives are it does not look quite so cool, and it reduces the top flight speed slightly... but then so does hanging rocket pods under the wing pylons so that is not such a big deal really. The main reason for fixing the landing gear on Mi-35M/M3 is for safety. In the past, there was some cases Mi-24s got combat damage or problems then could not extend the landing gear when landing and got serious accidents. More mi -35 on its way. “Within the framework of the agreement on military-technical co-operation with the Russian Federation in 2018, the Ministry of Defence of the Republic of Kazakhstan plans to conclude a contract for the supply of Su-30SM multirole aircraft, and until 2020 it has planned to purchase [additional] Su-30SM aircraft and Mi-35 helicopters,” the MoD in Astana told TASS without providing further details or the number of additional aircraft to be procured. JSC "Helicopters of Russia" presented at the Kubinka International Military Technical Forum "Army-2018" an upgraded version of the Mi-35M combat helicopter. 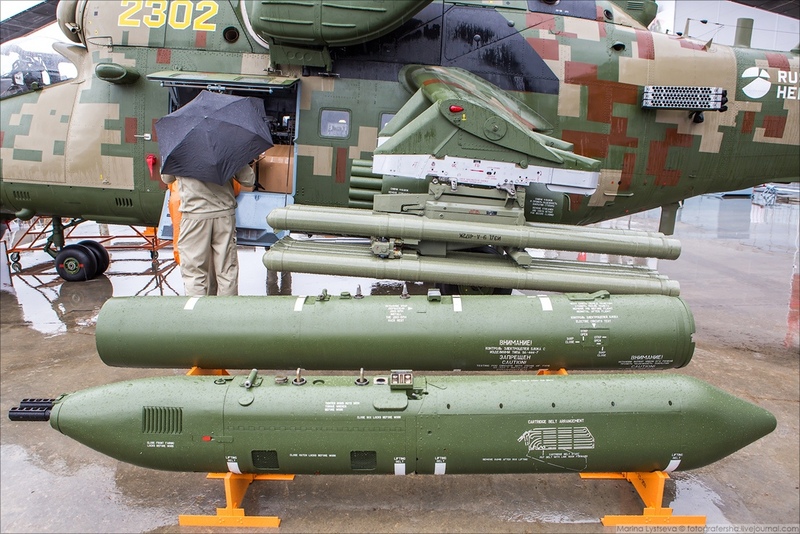 The main difference of the new version was the introduction into the armament of the helicopter of the 9K121M guided weapons complex "Vikhr-M" with a missile 9-A-4172K "Vikhr-1" missile with an automatic laser beam guidance system and a range of up to 10 thousand meters. Now the Ka-52 combat helicopters are equipped with the Vikhr-M missile system. 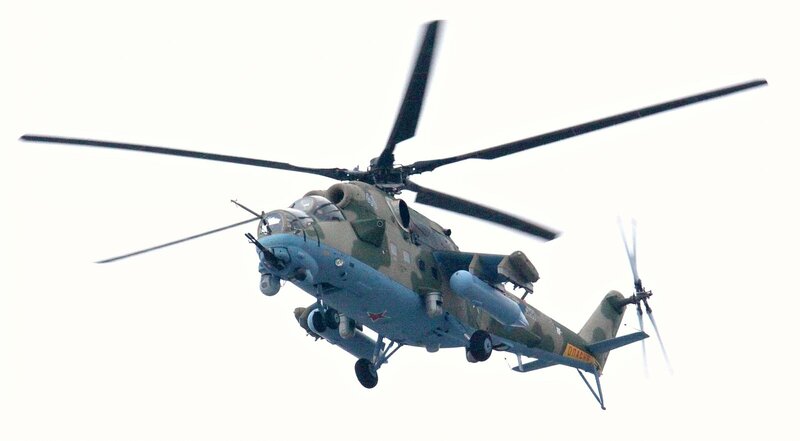 The upgraded Mi-35M helicopter is also equipped with a modified search and sight system OPS-24N-1L, the basis of which is the gyrostabilized round-the-clock optoelectronic system GOES-321MK. The missile complex "Strelets" with guided missiles 9M342 "Igla-S" air-to-air missiles is also included in the armament. The helicopter is equipped with the on-board defense complex "President-S35". In addition, VOR / ILS navigation and landing equipment, VIM-95-35 as well as the VND-94 radio range-meter for measuring the distance between the helicopter and ground-based radio beacons can be installed as additional equipment on the helicopter. In the "Military Informant" group of the social network "VKontakte", photos of the factory flight tests of the Mi-35M combat helicopter built at Rostvertol PJSC (part of the Helicopters of Russia JSC) for the Russian Aerospace Forces are published in Rostov-on-Don. The helicopter, which has an airborne number "41 blue", is equipped with an airborne defense complex "Vitebsk". Apparently, these photographs indicate the resumption of production at the Rostvertol Mi-35M helicopters for army aviation of the Russian Aerospace Force. Recall that previously, the Russian Air Force (VKS) under two contracts of 2010 and 2011 received a total of 49 Mi-35M helicopters in 2011-2014, but then their production for the VKS was discontinued (in 2017, five Mi-35M helicopters for aviation FSB of Russia). 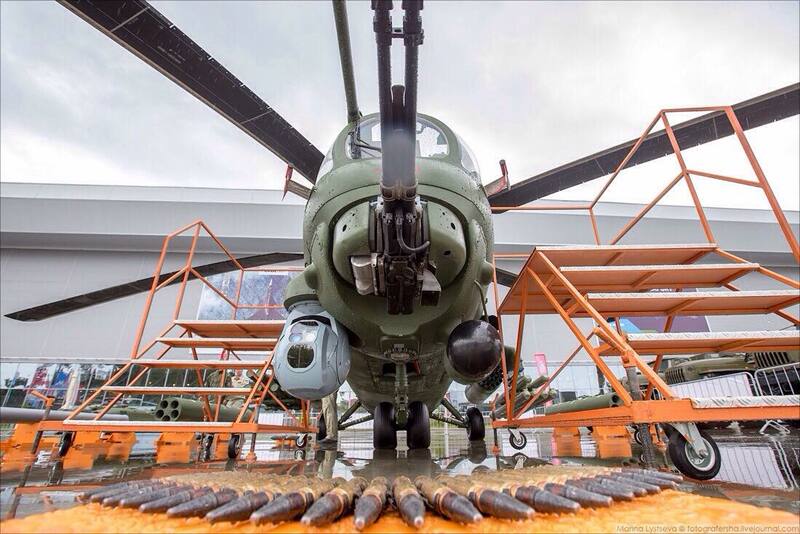 I actually think it's important for Russia to have a mix of all three combat helicopters (ka-52/mi-28/mi-24/35. ) all have there uses advantages and disadvantages. I see the hind as a good all purpose attack helicopter with added bonus of light transport/cargo and a good robust rugged design that's also fairly cheap to buy and maintain. I suspect it will be around for at least another decade or two. be interesting when or if they will ever have a replacement. I agree... the Hind shares components with the Havoc, but is different enough to be a useful addition for forces. L370-2 sensors of the Vitebsk self defence suit. A large-scale Mi-35M helicopter modernization program starts in the Russian army. According to the "Izvestia" Ministry of Defense, the updated machines will receive a Mi-35MV index. They will install new armor, engines and long-range optics, which will allow a few kilometers away at any time of the day and in any weather to find and destroy targets. Helicopters will also receive an electronic warfare system and protection from man-portable air defense systems. Work on updating the rotorcraft fleet began after studying the experience of using the Mi-35M in Syria, where they confirmed their high flight and combat qualities. The fundamental decision to modernize the Mi-35M has already been made, sources in the military department told Izvestia. At the moment, the terms of reference are being prepared to guide developers and designers. After modernization, the helicopters will seriously increase their combat effectiveness - the modified machine in the army has already received the nickname "Super Crocodile". Mi-35M helicopters, created in the middle of zero years, the Ministry of Defense began to massively buy after the military conflict with Georgia. 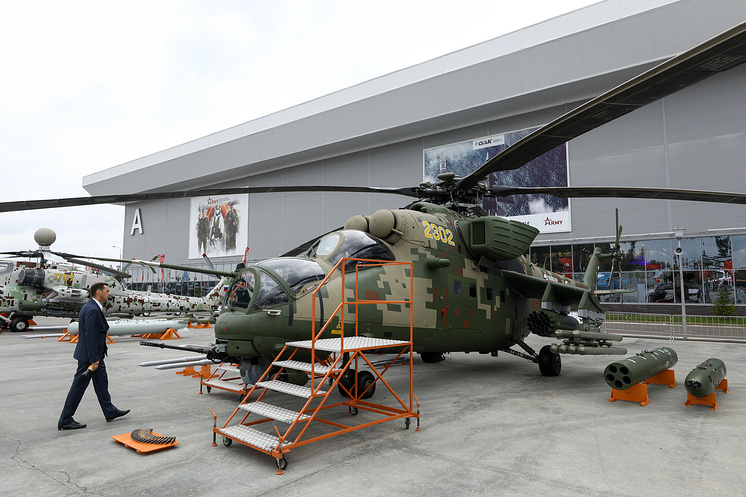 The army urgently needed a modern attack helicopter, since the machines of the new generation, the Mi-28 and Ka-52, were not yet mass-produced by industry. By the way, before the start of the operation in Syria, the Mi-35M helicopters were going to gradually withdraw from the armed forces. However, combat experience has shown that this machine is still one of the best Russian helicopters and it is not advisable to abandon it. The upgraded Mi-35MV will be equipped with a unique OPS-24N1 surveillance system, an onboard defense complex against President-S anti-aircraft weapons and a new radar. He will also receive new engines and reservations. The updated equipment will turn the helicopter into a modern flying airborne assault vehicle. The OPS-24N1 system will provide pilots with a circular review. It combines four stabilized optoelectronic observation stations: two of them are installed on the wings, one on the tail rotor support beam, and another one in the nose of the helicopter. The image obtained from them is displayed on the displays in the cockpit. This equipment will allow to detect and recognize targets at a distance of several kilometers in any weather and at any time of the day, as well as in case of strong smoke, which is especially important on the battlefield. These capabilities are provided by a unique SWIR camera with a photoreceiver module capable of converting a range of ultrashort waves that is invisible to the human eye. The airborne defense complex “President-S” provides protection against anti-aircraft guided missiles and air-to-air missiles equipped with radar and infrared homing heads. "President-S" will inform the crew in real-time about the radar or laser exposure of the aircraft, and, if necessary, will activate the operation of optical-electronic interference devices or heat traps. The helicopter is equipped with a mobile 23-mm caliber twin-barreled artillery gun, caliber 23 mm, unguided rockets and Sturm anti-tank guided missiles. He can also deliver up to seven fighters to the battlefield. So it has four short wave IR thermal cameras on the nose and tail and wings to give 360 degree view of threats on the ground out to a few kilometres... interesting. GarryB wrote: So it has four short wave IR thermal cameras on the nose and tail and wings to give 360 degree view of threats on the ground out to a few kilometres... interesting. Extremely, it is a DAS, similar to the one on F-35:I know a lot of american posters that wil be so happy to hear about this new. The home version of the defensive suite is called Vitebsk, therefore the V in the designation. The Russian military will use its experience gained in Syria to upgrade Mi-35M attack helicopters and Mi-8AMTSh multirole helicopters with new 360-degree OPS-24N1 surveillance and targeting opto-electronic systems, a Defense Ministry representative said Monday. The new system combines four stabilized GOES-321MK optoelectronic imaging devices, located in different parts of the vehicle. A combined image is produced and displayed to the helicopter pilot as well as inside the cabin. "Right now, the fundamental decision to test the system has already been taken. The test parameters and conditions are now being agreed on, but the exact timing of the work is still hard to determine… Overall, the opto-electronic equipment currently fitted on Mi-35M and Mi-8AMTSh helicopters is still up to standard, but the experience from the Syrian operation has opened new directions for developing opto-electronic systems," the ministry representative told the Russian Izvestia newspaper. Developed by Russia's Shvabe optical electronics company, part of the Rostec state corporation, the system is capable of imaging through fog, smoke and, most importantly, dust storms. Upgraded helicopters will be able to identify targets as far as several miles away due to an indium gallium arsenide-based infrared frequency camera. The system will be able to transmit images in real time from the helicopter via a USB computer connection." There is another remarkable point in this announcement, it states that the helicopter will be fitted with a new radar. Yes, it is a DAS system... hahaha... I know a few F-35 fanbois will be crushed to know Russian helos have that now too, but they were developing DAS for the Su-57 and Su-35 and MiG-35 too and they likely already have it too. Shortwave IIR has been shown with the Armata tank and in the footage I saw it just looks like black and white video... but it could see through glass, which IIR normally doesn't. Interesting regarding the radar... one would assume they developed a new ground search radar for the Mi-28NM, which they are now retrofitting to other helos... is it going to be cheap enough to put on any helo or will one in four or five helos get it and pass target info to other aircraft in the flight? A radar on top of the rotor head needs a modification of the gearbox. That´s why the Mi-28N doesn´t carry one. This EO systems will also feed info to the Vitebsk system. It can detect some nasty fast moving objects around the helicopter. I think there is something mistake here because Goes-321MK is not so cheap that they install 4 of it on a helo. They only need only 1 mounted on the top of rotor to cover 360° or maximum 2, 1 on the nose (already have a similar Goes-321 (Mi-8/17) or Goes-342 (Mi-35M)) and 1 on the tail to do that. The only thing on the rotor head of the Mi-28N is an oil sump... you wouldn't put a gearbox for the two engines on an Mi-28N on top of the rotor hub. There are several Mi-28Ns with rotor mounted radar balls... it is just too expensive to fit it to all Mi-28Ns so far AFAIK. In the link above about delivers, an Mi-28N with a rotor ball is visible... well not sure if it is a Mi-28N or Mi-28UB... but the ball is there. Only the Mi-28UB and the export Mi-28NE carry a radar. "The radar allowed the helicopter to search for ground and airborne targets while hiding behind abstacles; it also catered for piloting and navigation tasks. However, it required a new main gearbox because the existing one was not compatible with the MMR." There are mechanical joints between the rotor shaft, coming from the gearbox, and the radar installation. The old gearbox couldn´t be fitted with that. It seems it can be retrofitted, but until now the VKS wasn´t keen of spending the money. They clearly have a new gearbox design that does allow mast mounted radar, and a new gearbox will be a mere fraction of the cost of a new radar. Over time gearboxes need replacement so if they just make the new models over time the problem will solve itself. More importantly the older models used Ukrainian engine and the new ones are better so I would assume they would need a new gearbox anyway for the new more powerful engines. AFAIK radar for Mi-28N was not ready yet, when Russian MoD sign contract for them, so they are not included in contract. Later export version got the radar. Russian MoD sign contract for Mi-28UB with radar, as they were ready to be included in contract. 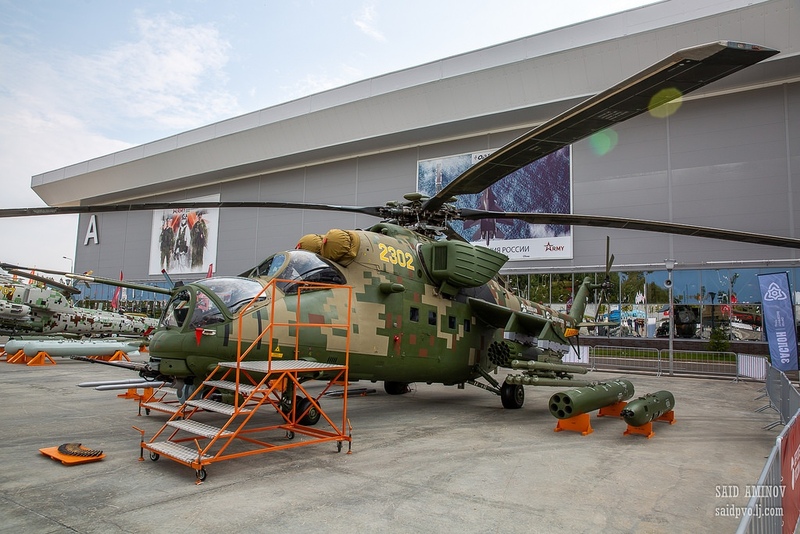 The Mi-28N and Mi-35M will be retrofitted with new tech/gearboxes/rotor blades as they come along for heavy maintenance. They learned quite a few things from the PSV high-speed heli program. It seems the VKS wants its attack helis equipped with radars. All Ka-52 are equipped with radars. Mi-28UB and the new Mi-28NM also. Now the "older" Mi-28N and Mi-35M will also get one. They will rather choose to buy a few helicopters less insted of a new model being without radar.